Although it does most of its work within the state of Utah, Moving Connections is federally licensed, bonded, and insured. That means peace of mind for you. If you’re looking for a seamless transition to your new residence, then give Moving Connections a call. We at Moving Connections offer the highest level of service in the moving industry. Selecting our personnel only from among those who have professional moving experience, we field the best moving crews in the business. If you add to that the fact that Moving Connections is federally licensed, bonded, and insured, you know that we are conforming to the highest standards in the moving industry. These "Moving Connections' 1 And 2 Bedroom Small Moves" will often cost between $1200-1500. And we'll pick up your items on the specific day you request and deliver your items to your designated destination on the day you specify. A very common move that Moving Connections does on a weekly basis is a household move from somewhere along the Wasatch Front down to the St George area. Moving Connections have put together a package deal of $2350 which includes professional moving truck with a box length of 26 feet and a width of 8 feet and a height of a little over 8 feet, blankets, dollies, tools and of course, two supermen. The approximately 10,000 pounds that this truck handles will usually tackle up to a 3 bedroom home which is 95% of the moves made. If Moving Connections is moving you to St George it's a perfect time to begin to utilize the many resources and bounties of St George. For example click on the picture to the left to go the Moving Connections 'Support - Advice - Assistance' page and discover St George for the first time. Once you are on the 'Support - Advice - Assistance' page go ahead and open the .pdf link found there and tape the list of emergency and useful phone numbers on your refrigerator. Moving Connections has gone to great pains to find those links and connections to integrate you quickly into St George life. 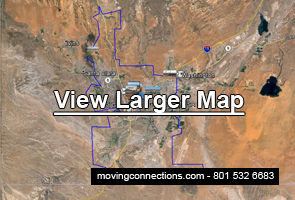 If you’re contemplating a business move to or from St. George, please give Moving Connections your consideration. Moving Connections handles every kind of business move from office transitions across the corridor or up one floor, to multi-day, multi-truck corporate relocations to other cities. Since we hire only experienced professional moving crews, you can relax knowing that they will handle your equipment, files, and furniture with utmost care. Moving Connections is in business for real. As a businessperson yourself, you know how important that is. That’s why we have a federal motor carrier number with a federal license. And we are bonded and insured according to federal regulations. That should give you peace of mind. Moving Connections will give you top tier professional service, but it will do so with a smile. As professional and experienced as we are, we are still local and friendly.